A conference in Downtown is exactly what I needed. I get to learn something. I get to mingle with colleagues. And most importantly, I get to eat! Yes, there is a variety of restaurants within such a small area, it's like a kid in a candy store. Furthermore, there are plenty of people to eat with, enhancing the experience even more. If dining with 6 of my colleagues wasn't enough for variety; Kim joined us as well. We ended up going to a restaurant which was fairly close to the Wall Centre (where our conference was held). 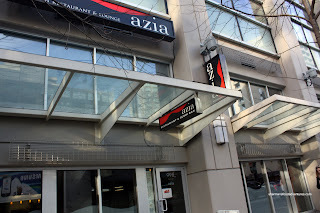 Located in the Scotiabank Theatre building, Azia serves up cuisine from a wide range of Asian countries. Norm ally, that would scare some people, especially since Vancouver is already known for its authentic Asian food. However, we must take into account that Azia tries to be all things Asian mostly to the Downtown crowd. With that in mind, we cannot expect the finest Asian cuisine around. They don't claim to be nor are they trying to be. Since Kim and I were the only Asians at the table, we had a unique perspective of the food. Kim and I were able to coerce everyone to order items to share. 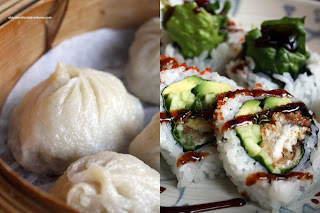 We end ed up getting 4 dishes, 2 sushi rolls and Xiao Long Bao. With the Chinese dishes, it included soup, rice and spring rolls. Since there were only 4 dishes, we only received 4 bowls of Swirl Egg Corn Soup. Not sure if the DSLRs had anything bearing on it; but they brought 3 more so we all had soup. A nice gesture nonetheless. 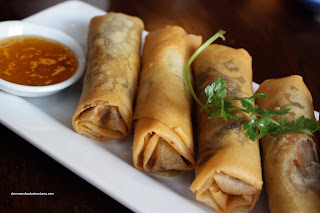 Well, the meal started off pretty good, the Spring Rolls were crispy and not too oily. They were stuffed with quite a bit of filling. The first main dish to arrive was the Broccoli and Beef. Visually, it looked quite good with rich coloured beef and bright green florets. 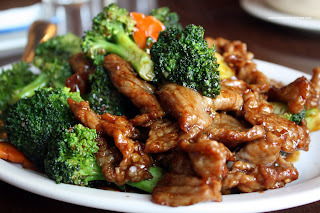 The broccoli was still crispy while the beef was a bit on the chewy side. The downside of this dish was its lack of flavour. Seems a bit impossible since the colour looks so good; but curiously it was. When the Evil Jungle Green Curry first arrived, someone remarked that it didn't look green at all. Well, green curry does have green in it; but it's not really supposed to be that green. But, this version was devoid of any green at all. A clear indication that it will be mostly coconut milk with only a hint of spiciness. Actually, it was a bit spicier than it looked; yet it wasn't mind-blowing. As you can see, there is no absence of eggplant, chicken, and green beans. 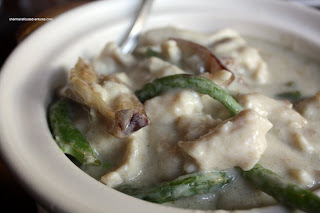 For the less adventurous, this is decent interpretation of green curry. 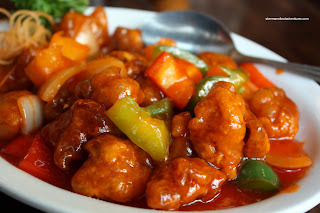 At first, we weren't going to order Sweet and Sour Pork since it's a bit boring. Well, Hot Mama insisted we have it and here it is. Again, it looked alright with onions, peppers and pineapple. In actuality, it was too sweet and the pork was a tad overcooked. Mind you, it wasn't horrible. 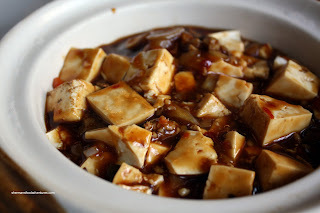 Kim likes things spicy and decided on a classic - the Ma Po Tofu. Unfortunately, we didn't take into a ccount that it would probably be mild. What we got was something less than mild, more along the lines of bland. It was more tart than spicy; however, I thought the tofu itself was decent. It held its shape while still being soft enough in texture. Yet another Chinese classic arrived next, the Kung Pow Chicken (classic is a very loose term in this case). What can we say about this one... Oh, it was bland. 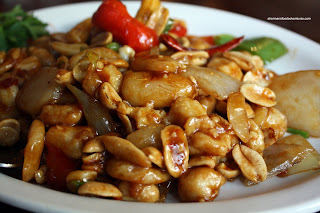 Now let me reiterate here, I'm speaking from the perspective of a Chinese person who grew up eating real Chinese food. So, everything will be bland to me and Kim. But I'll clar ify this later in my conclusion. I digress... Texturally, this dish was pretty good with peanuts, peppers and onions. The chicken was quite moist as well. To fulfill the curiosity quotient, Kim suggested we try the Xiao Long Bao. Obviously, we already suspected that they would not be very good; but we thought it would be a good litmus test. Well, they really weren't all that good. First, the dumpling skin was doughy and the pork filling was a bit gritty. Second, and most importantly, there was little in the way of "juice" (which is critical). We also needed to try out the sushi bar and got 2 rolls - Mango Roll and Spider Roll. Visually appealing with bright colours, the mango roll was alright. I would've preferred if the rice was a bit more firm. 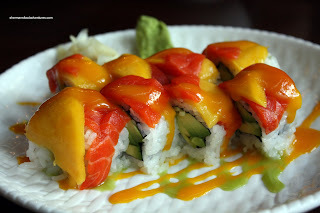 I like the mango wasabi sauce, it helped provide a sweet kick to an otherwise delicate roll. The spider roll was a little loose and was a bit hard to keep together when picked up. Despite that, once again, it was decent. When we finally got the bill, the total was indeed very reasonable, especially considering the decor, location and level of service. On the flip side, the portions were quite small. Obviously, the pricing and portion size go hand-in-hand. In terms of authenticity; predictably, it was only somewhat close. I mean it's not Manchu Wok we're talking about here. With that in mind, someone looking for a truly authentic experience should look elsewhere. Yet, that brings up the premise behind Azia. It doesn't advertise to be the best Chinese or Japanese restaurant. Rather, it's a place that caters to the Downtown and tourist crowd who want something safe, decent and inexpensive. I've gone here a fair number of times for lunch and found their food to be pretty good. I thought their intention was to be an Asian fusion restaurant rather than one of authentic Asian cuisine. As a result, I usually order the non-traditional dishes when I come here. If you go again next time, try their ribs - it's really good.